When folks in the southern Adirondacks awake these winter mornings, it can be rough to peel back the blankets and plant bare feet on the night-chilled floor. But you plod to the wood stove anyway. Embers in the bottom flush bright red as you swing open the firebox door, letting in a gust of air as you insert logs to warm up the house. Your flannel-clad elbow scrapes away a little circle of frost from the kitchen window so you read the 6 a.m. temperature--five degrees. You're grateful that's above zero instead of below. Hot pancakes and fresh warm maple syrup are a treat that can't be beat. This calls for a hot breakfast and an oversized cup of coffee. Pancakes hit the griddle, and you warm a pitcher of your own maple syrup. All too soon your fork is zig-zagging across your plate, gathering up the last vestiges of sweet, sticky syrup from your plate. You cradle your second mug of steaming coffee in your still-chilly fingers until you see streaks of daylight poking their way between the trees. Fat flakes of snow are falling. It's time. Setting your cup in the sink, you stoke the fire one more time and cut back the draft so the wood won't burn out before your return. You check the outdoor thermometer again. Six. It's a day for layers, lots of layers, fabric that breathes as it traps warmth near your body. Insulated boots are in order, as are lined gloves and a knitted cap to pull down over your ears. 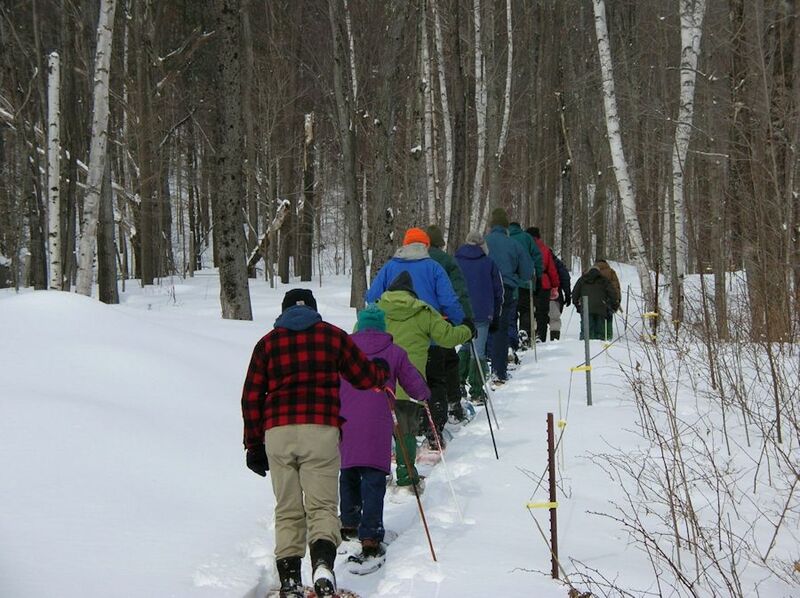 A New York maple producer leads a group of visitors into the sugar bush to see the taps and tubing. You step out onto the porch, soaking in the stillness of the woods as the snow silently builds on branches and blankets the ground. You grab the pair of snowshoes leaning up against the side of the house. That snow isn't going to quite any time soon, and you have your sugar bush to attend to, snow or no snow. You'll wade through miles of the fluff before you get home. 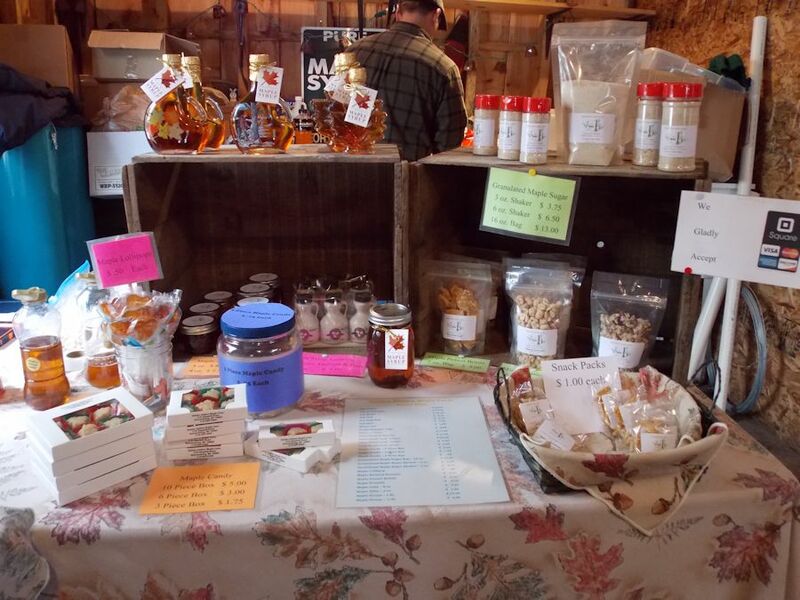 of other maple products: sugar, cream, cotton candy, peanuts, popcorn, jelly, coffee and much more. This scene is played out late winter every year all over the Adirondacks, and has for centuries. Many of today's maple producers are following in the footsteps of generations of family before them who have worked the same sugar bushes. In one small southern Adirondack town, Warren County's four largest maple producers each shared with me the story behind his operation. Charles Wallace grew up making syrup with his father, gradually assuming a larger role, until he and his wife now take primary responsibility for Hidden Hollow Maple Farm, both production and marketing. Charles' adult son provides a great deal of help, which is vital, since they all have "day jobs". The Wallace family uses a traditional wood-fired evaporator, and their most popular product is a naturally dark maple syrup. 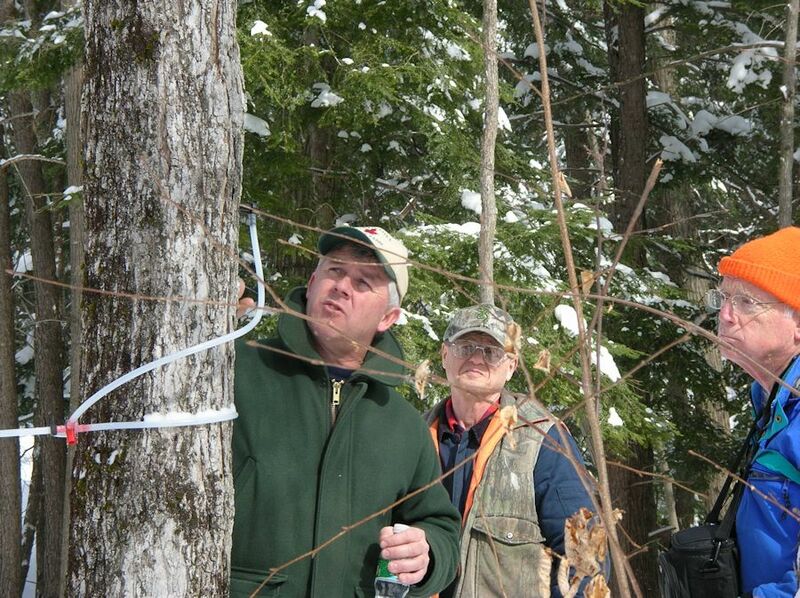 Mike Hill and Ralph Senecal both were brought up in families where sugaring was done. 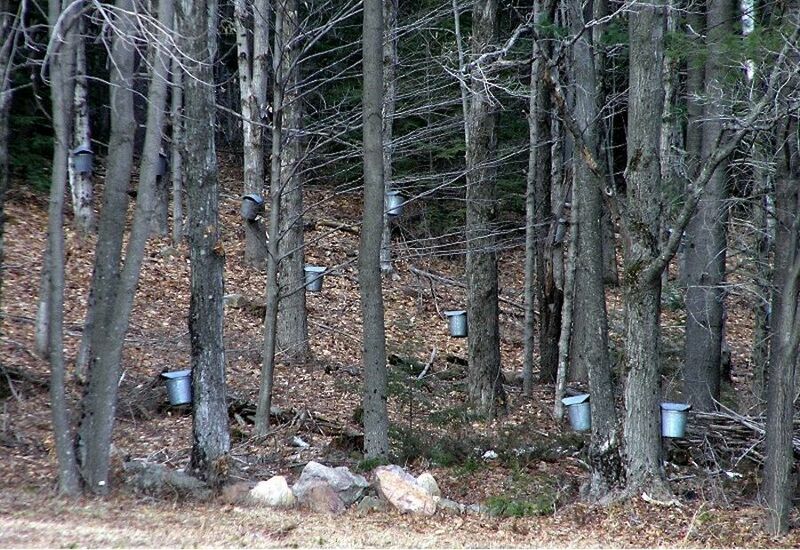 Mike, whose family home was had formerly been a one-room schoolhouse, learned the art of sugaring from an uncle and, as a young boy, soon created his own mini-farm, hanging buckets on trees and carrying the sap from each tree to the improvised sugarhouse. The sugar house had been jerry-rigged in what had served as the schools outdoor privy. He pressed into service an old stove fueled by an inverted jar of kerosene. 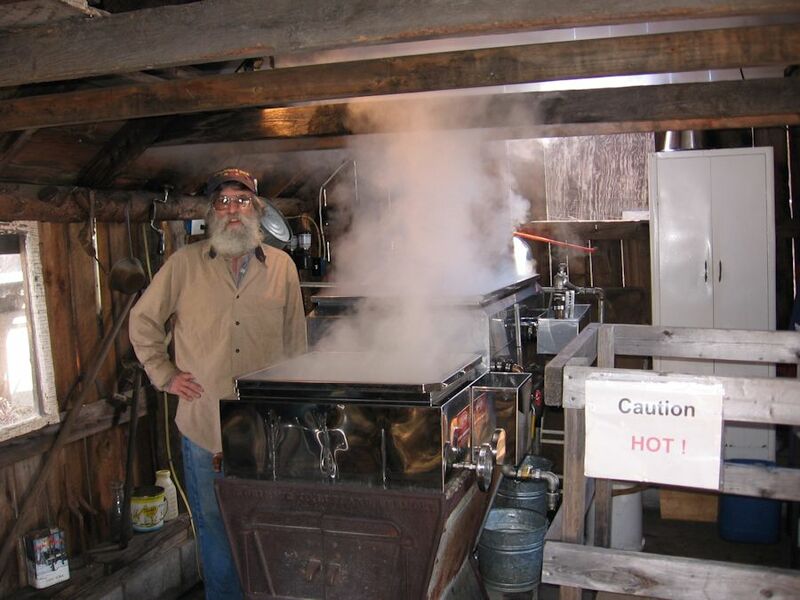 He and Ralph Senecal met while teaching high school and decided to pool their efforts in syrup-making, eventually buying in Thurman an old sugar bush that had been sugared for over 150 years, most recently by a local man who had worked it well beyond his 90th birthday. 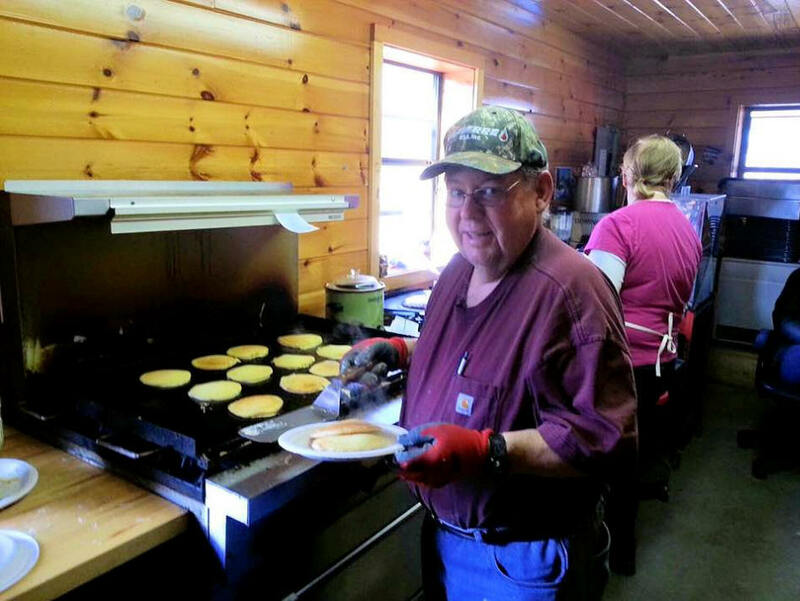 Mike and Ralph traditionally offer pancake breakfasts at their site when tourists come around. his evaporator, carefully watching the boiling sap as steam billows around him. At Adirondack Gold Maple Farm, Marc and Cheryl Kenyon sugar on land that was farmed by the Kenyon family for over 200 years. Marc remembers his grandfather, Oscar Kenyon, boiling sap in the very sugar house Marc uses today. In his mind, he can still see Oscar skimming the sap and flipping the foam onto the floor, or adding a bit of butter to the top of the evaporator to keep the sap from boiling over. Marc's dad, Don Kenyon, ran the operation for years, too, and when Marc and Cheryl took over, they called it Adirondack Gold Maple Farm. As a small hat-tip to Oscar, they still hang bucked on 100 of their trees. Toad Hill's Randy Galusha taps a maple and gets ready to hook up the tubing to it. Randy and Patrick Galusha used to watch their grandmother Stella Galusha boiling sap in a kettle outsider her home, so one day after school, when they found three old maple taps in the barn, they decided they were going to make syrup, too. Their dad admits that when they showed him the taps and coffee cans they planned to use for buckets, he offered to help. The whole family became involved, learning from neighbors and gradually expanding, adding equipment and upgrading their facilities. After college, Randy and his wife Jill settled nearby and remained very involved in the sugaring operation, eventually taking it over. if food is being processed. When the evaporator is running, steam billows out of the cupola on top. 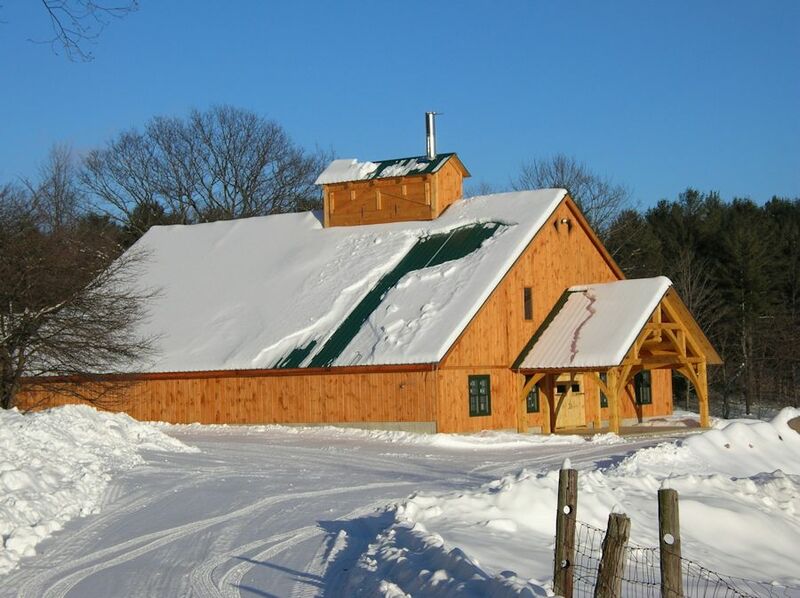 Over the years these operations have all grown dramatically, with newly-constructed sugar houses, Plastic tubing to carry sap to the sugarhouses, more efficient evaporators, whose work is assisted by use of a SteamAway and reverse osmosis machines. Taps used today are designed to minimize damage to the trees, and tubing size is now optimized to help the sap flow more steadily to the sugar houses. Technology now makes it possible to monitor the tubing – miles and miles of it – from a video display unit in the sugar house, enabling the producer to see if any of the tubing is leaking or has been damaged by a marauding Adirondack black bear. sugarhouse as tribute to the generations of maple producers who worked this sugar bush in bygone days.